The last new set in Fantasy Printshop's German serial sets is this one for larger aircraft. 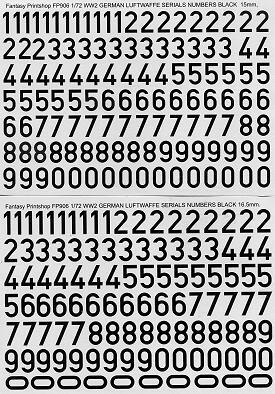 THis particular set includes nothing but numbers and would be appropriate for earlier civil types where the registration codes were basically D followed by four numbers. These are in the style used not only by the Germans, but in some cases, are quite similar to those used by the British as well. These are what would be used for the radio call signs of newly built military planes as well as civilian aircraft. The sheets (and there are two full size sheets) cover markings that are 15 and 16.5 mm in size. There are at least ten of each number. An application sheet is provided to give guidance as to which aircraft would use which size markings. These would most likely be seen on very large planes like bombers and transports, but also on Lufthansa and other civil types. In all, a very handy sheet for those wanting to build something a bit different from the norm. In case you haven't figured it out, these sheets can also be used for larger scales. Simply divide what is provided for 1/72 into whatever is appropriate. I should point out that I grey-scaled the scan on these since there is no color in them. The sheet backing is really the usual very light blue.